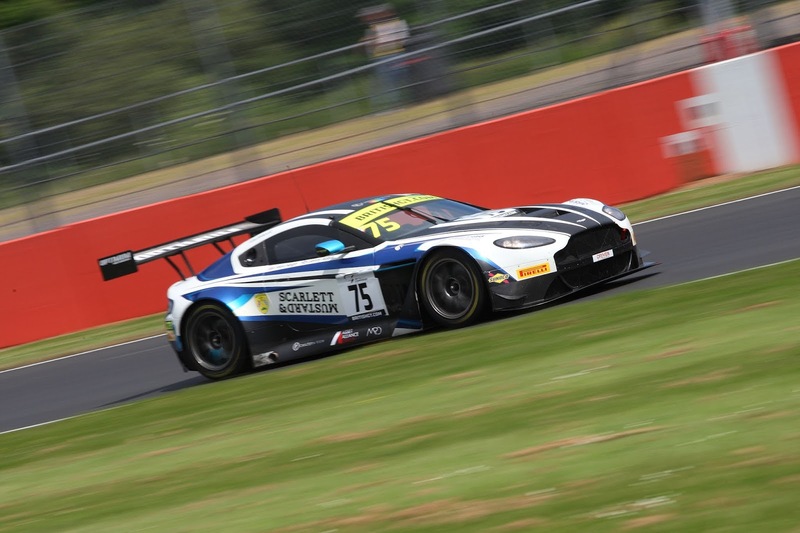 Qualifying for the British GT Championship's Silverstone 500 endurance event hadn't really painted a reliable picture as to who was hot and who was not before the start of Sundays three hour race with just two AMR GT3 cars represented in the top five. Sundays morning's warm up gave the teams food for thought as early cloud cover kept the air and track temperatures lower than what they had been used to going into the fourth round of the season but it was the #11 TF Sport of Mark Farmer and Nicki Thiim who reacted the quickest to the changeable conditions to log the fastest time of just over half a second from the best of the rest. Fortunately with a post midday grid, the sun had had time to works its magic to leave clear blue skies and warming temperatures as the Am drivers were readied to start the first leg of the race. 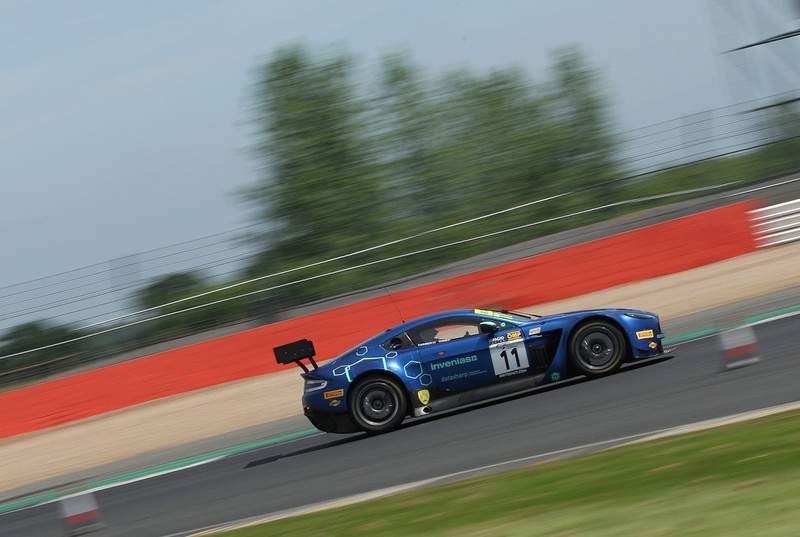 Thirty runners and riders had successfully managed to navigate the first few corners as track position was initially maintained however there was some contact amongst a few within the GT4 ranks that rendered race day over for some at a very early stage. 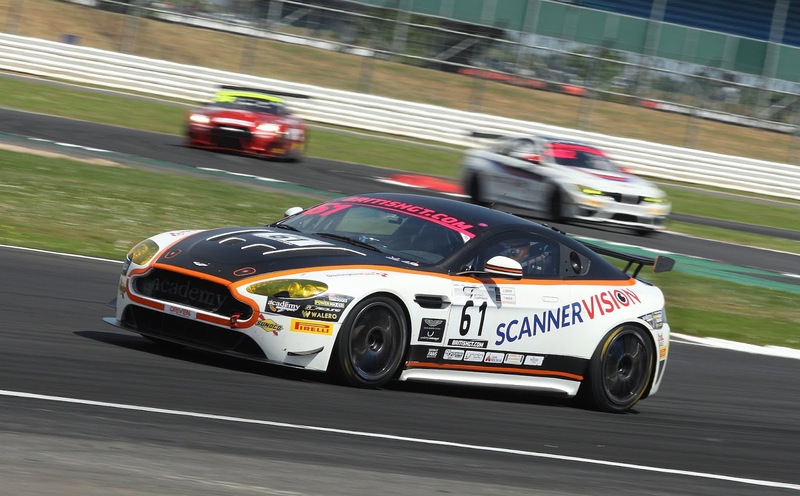 As expected, the silver-silver pairing within the Nissan GTR soon put distance between themselves and the chasing Mark Farmer whilst Andrew Howard immediately dropped back towards the rear of the GT3 field in a weekend where his #99 Vantage GT3 never really shone. 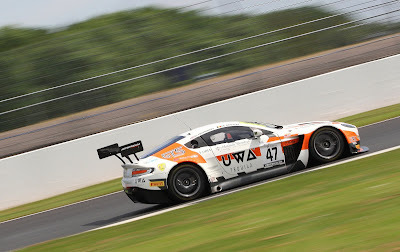 In GT4, the leading Academy car of Tom Wood was giving the leading McLaren a run for their money hoping they would damage their tyres at an early stage, a race that its sister car with Will Moore aboard wanted to join in, but as ever that only served to slow both of them down and into the hands of the next McLaren behind. 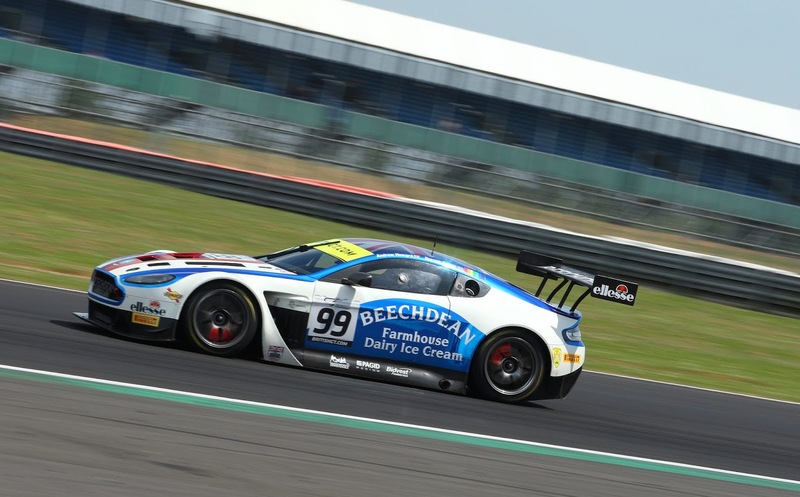 For the top GT3 runners from last time out at Snetterton, it was all a case of creating sufficient a gap to those behind to accommodate the success time penalty that would be later applied to their third compulsory stop - that meant +20 seconds for the #17 TF Sport car of Derek Johnston and Marco Sorensen, +15 seconds for the Beechdean of Howard and Darren Turner and +10 seconds for Farmer and Thiim. 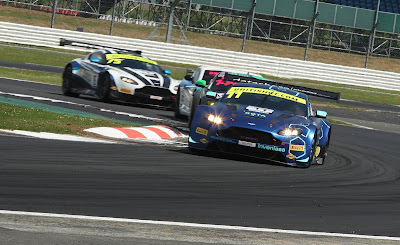 Having a great run out in the early stages was Matt George in the guesting #144 Generation AMR SuperRacing V8 Vantage GT4 who, after having started from P16 was soon battling with the two Academy cars for position before achieving that and moving onto the P2 McLaren ahead. 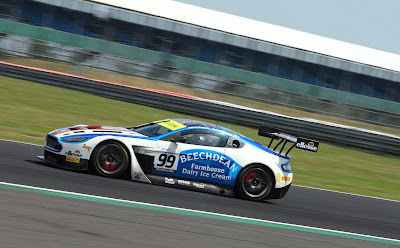 During the first half an hour, the #47 Jetstream Motorsport car of Graham Davidson had been keeping a watching brief behind Farmer before track congestion allowed him to close the gap from seconds to just a cars length. Unfortunately for both, that lead to an over ambitious move by Davidson on the #11 car coming out of the Maggots/Becketts complex that would see contact with the rear end of the #11 car sending Farmer into a spin off the track whilst the #47 appeared able to continue. Considering what, how and where - that could have easily been curtains for the TF Sport car but miraculously Farmer was able to gather his thoughts and the car to return to the track having lost just one position. 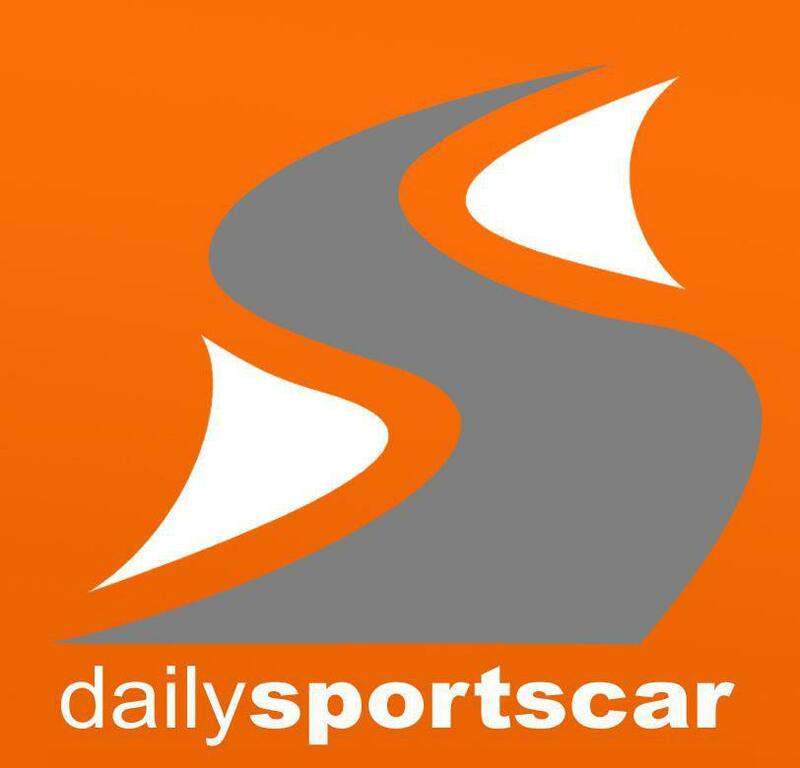 For Davidson however, that transgression would give him and co driver Maxime Martin firstly an unannounced pit stop for damage before another stop for a ten second stop and go for avoidable contact - everything that would seal their fate in the race to a lowly finish. By the first hour mark the Am drivers had all swapped over to their respective Pro drivers and it was Marco Sorensen aboard the #17 TF Sport car who came out in front by the time the cycle had made its way through the pack. 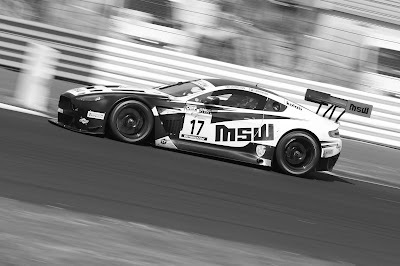 To exaggerate the gap to those behind the #17 was by virtue of Struan Moore being actively slower in his first stint aboard the Nissan GT3 which held up everyone else behind him. It was only later it became apparent that this was because he didn't have time to adjust his seat properly and therefore couldn't reach the pedal box properly!! Amongst those catching were Thiim in the #11 car and a certain Jonny Adam in the #75 Optimum car who had had until then a very productive but uneventful race with Flick Haigh aboard. 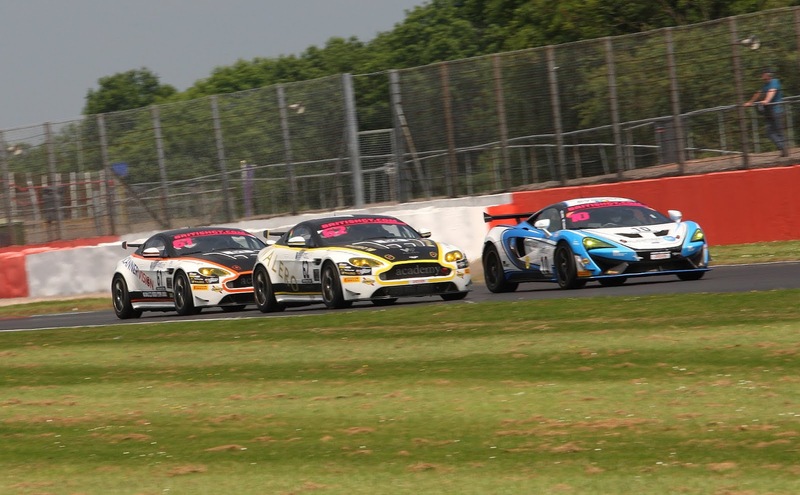 It transpired over the weekend that the Optimum car had blown its engine after Snetterton and the performance of the resulting change had given the Flick Haigh/Adam combo renewed motivation to pursue. Much the same was for Thiim who had just passed two cars in two laps to reclaim P2 overall but for Martin, now in the Jetstream car, the bad day continued by spinning coming out of Luffield. 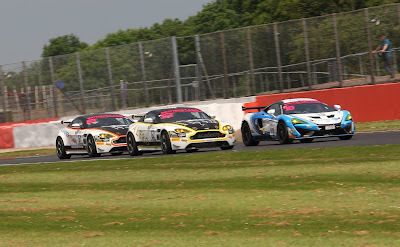 With just over an hour to go the timing screens replicated those of Snetterton by having four AMR cars in the top four - #17/#11/#75/#99 in the short transition between taking the Pro out - putting the Am back in and then swapping over back to the Pro again for the final run to the flag. The two Academy cars looked set for a decent finish with the #61 of Wood/Jonck looking good over the #62 of Moore/Nichol-Jones considering the impending #62's 10 second success penalty at the final stop. The #144 car of George/Holder however got a 10 second stop and go penalty (for a reason never really clarified at the time) and that would put them well out of contention. With just 45 minutes of the race remaining, Farmer pitted for the final time to hand back to Thiim but the additional ten seconds appeared to take an eternity. Leaving two thick black lines behind him on the pit apron Thiim exited pit lane just ahead of the #33 Lamborghini of Phil Keen in a 'winner takes all' sprint to the flag. 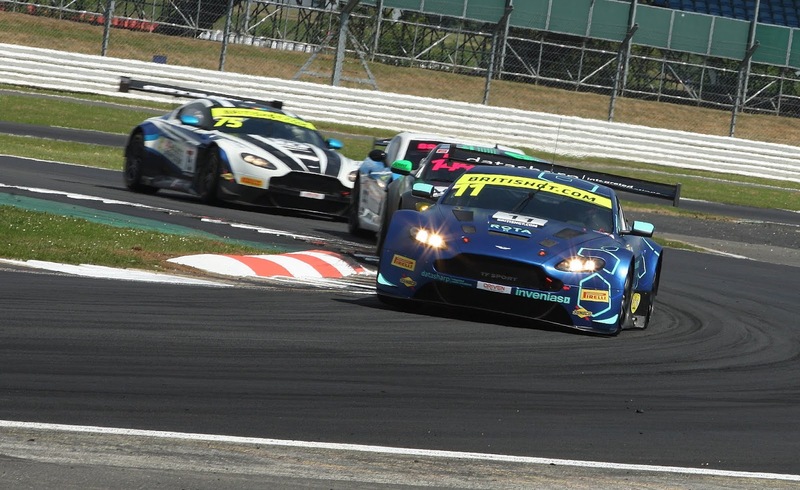 What spun the other AMR cars around was the fact that the #17 car had to serve the maximum additional 20 seconds whilst Adam in the #75 car had none - that allowed Adam to jump onto the rear of the #33 Lamborghini in that sprint to the flag. Disaster was to befall the #61 Academy car with just five or so minutes remaining as entering onto the Hanger Straight for almost the penultimate time the normally reliable V8 engine let go in dramatic fashion leaving the Dane with no choice but to park it on the grass. 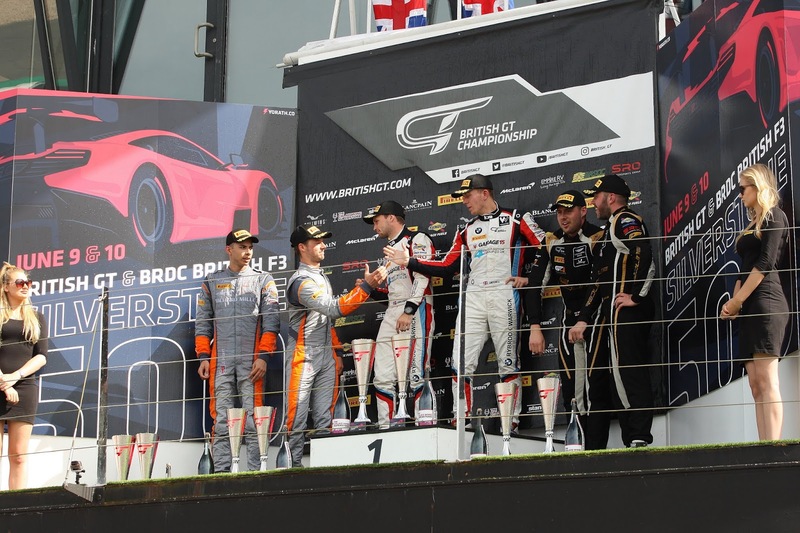 With fluid also on the track that could have easily have led to a Safety Car in the final stages, Race Control luckily left it under the local control of the track marshals to allow Thiim to take the flag by just 3.5 seconds to Keen who in turn finished 4.5 seconds ahead of Adam. 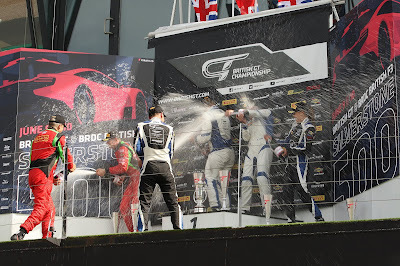 Giving his team a bitter-sweet moment was Matt Nichol-Jones who, having diced with the #55 Ginetta only to loose out on the final step to the podium on track but to have it reinstated post race after the late move not the #62 car by the Ginetta included avoidable contact. The disappointment and frustration on young Tom Wood's face was all too evident. As a whole, the Silverstone 500 started as a completely open race but for the Am drivers of two AMR teams who showed great resolve to overcome their own adversity to finish on the podium again. 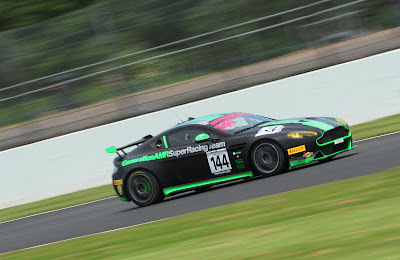 Considering Farmer had been spun off the circuit at one point, he drove an impeccable race backed up by impeccable service from the TF Sport crew not to mention the contribution from a very handy AMR factory driver whilst on the other side of the TF Sport garage, their performance was ultimately hindered by a success penalty they couldn't quite overcome on track. This result now places Farmer/Thiim just 2.5 points behind Championship leading Keen/Minshaw with Adam/Haigh up to P4 and Johnston/Sorensen just behind in P5 whilst in GT4 the Moore/Nichol-Jones crew move up to P2 overall. The next round of the British GT Championship comes from Spa Francorchamps at the end of July.